The chart of foreclosure filings in Miami is going vertical. For the past several years we have seen condo towers going vertical across the city skyline without any concern for poor fundamentals in the residential real estate market. Ten years after the last housing crash and South Florida appears to have some issues piling-up once again. Although interest rates have been low, they have been artificially suppressed. Any sharp rate increase will pop this latest bubble and do it quickly. Today we will focus on the sharp increase in the Miami-Dade residential foreclosure filings. Take a look at the purple line in this chart. The number of new foreclosure filings in Miami is through the roof! Our next chart shows the single-family and condo property foreclosure filings across Miami-Dade County. In June we updated the existing foreclosures in the Miami area. Rates have stabilized for now and don’t appear to be creating much of a headwind for the residential real estate market. Sometimes a quick spike in rates gets some buyers off the fence. Rates are still very low by historical standards and unless you see 30-year mortgages over the 5% mark, they shouldn’t be a problem. However, the residential market in South Florida is priced for perfection and if you have a spike in rates, slowing sales activity and a wave of foreclosures hitting the market, look out below! 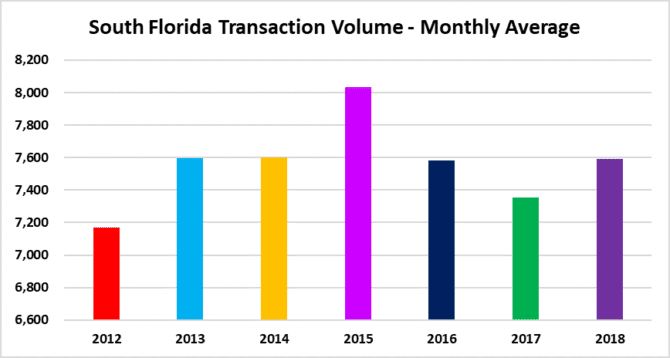 Residential transaction volume picked-up in the last few months, which should alleviate some of the summertime sadness caused by the onslaught of new foreclosures across South Florida. This entry was posted in Foreclosure activity, Miami foreclosures, Miami real estate and tagged housing bubble, Miami foreclosures, Miami real estate, REO. Bookmark the permalink. Both comments and trackbacks are currently closed.